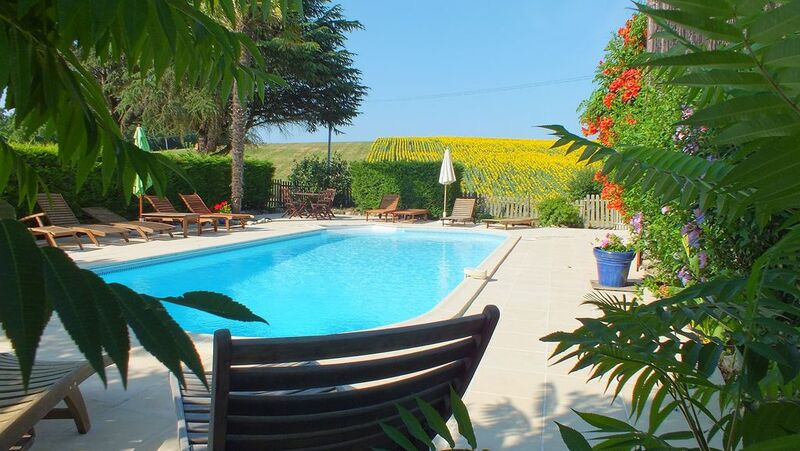 Situated in the undiscovered Lot-et-Garonne, 14km from Marmande, Peyrenègre is situated at the end of a quiet no-through road and offers you the opportunity to relax and recharge your batteries in the heart of the countryside. Panoramic views over cornfields, sunflower fields and the hazelnut trees for which this area is famous. Well equipped and comfortably furnished the cottages retain the characteristic features of this 150 year old stone farmhouse Whether you are a couple, a family or a larger group we can organise the accommodation to meet your needs. The 10m x 4.5m heated pool has salt water filtration and is well equipped with wooden sun-beds and pool games. A BBQ, ping-pong table, a variety of outdoor games and trampoline are provided. All bed linen, towels and pool towels are provided. We provide baby equipment including cots and we welcome well behaved pets. Free use of the sauna, hot tub and 4 adult bikes. Close to several Bastide towns and the wine growing regions. Andrew and I (Lucy) moved to Peyrenegre in May 2012. We left behind successful jobs in the Thoroughbred breeding industry which is where we both met 12 years ago at The National stud in Newmarket. Deciding to leave England did not come lightly although slightly easy for me as my Parents already lived in France, for Andrew it was tough leaving friends and family behind. We had each other and we were excited to be starting a new adventure and a chapter in our lives together. So we moved to Peyrenegre with our two dogs at the time, and my mum and Dad moved from near Poitiers to join us who now live next door. Neither of us had any experience running a Gite business having always worked with horses, we certainly hit the ground running our first year as we were fully booked as Peyrenegre had already been ran as a successful business. We had big boots to fill!! Nervously and excitedly we started our first season here, goodness me it was hard work but a lot of fun. It made mucking out lots of stables every day seem so much easier. Who ever said moving to france to run a holiday business was easy was oh so wrong, Andrew and I have youth on our side so for now we have an advantage! We had grand ideas for changes at Peyrenegre which after the first season we were able to start. Now 6 years on we are delighted we made the move regularly asked do you miss England, would you go back? We smile shrug our shoulders and say no way would we ever go back, this is our home now we have made a life here, it was the best decision we have ever made. Anyone reading this thinking they would like to move to France do it whats stopping you. You only live once right? Now 6 years on we are delighted we made the move regularly asked do you miss England, would you go back? We smile shrug our shoulders and say no way would we ever go back, this is our home now we have made a life here, it was the best decision we have ever made. Anyone reading this thinking they would like to move to France do it whats stopping you. You only live once right? Peyrenegre has grown with us, we started with 6 hens we now have 39 hens, which provide the guests with fresh eggs. 11 ducks, ducklings occasionally, 2 guinea pigs, 3 dogs, 7 cats, and 10 sheep, with there lambs when its the season, and not forgetting the 2 horses. A large vegetable patch that in season provides the guests with fresh homegrown vegetables. So I guess now we have a small holding, as well as the gites, the animals here are all away from the gites, but can be a part of the gites if the guests which but are all here for a purpose. The children on holiday love coming with us to feed the chickens and ducks and hunt for eggs, and come and pick fresh tomatoes too. We love to be able to share our home and also our passion and love for all the animals here. As you can read from this we are passionate about what we do and what we offer here, We feel here at Peyrenegre we have something special to offer for everyone. Whilst we are very family oriented, we also are a perfect retreat for couples wanting to sit back and relax, re charge there batteries and be surrounded by beautiful countryside. We are certainly very lucky to live here. We look forward to welcoming past guests that have become friends and meeting new people and sharing our wonderful home. We have a heated salt water pool to 28 degrees, that is fully enclosed and alarmed. Along with a play area complete with a sand pit, trampoline, swing ect so that the children can run around and let off steam. Opposite the gites we have an indoor play room full of toys, board games, dvds and a 4 in 1 games table, within easy reach of the gites so that you can keep an eye on them. We are happy to take children with us under supervision to help search for eggs from the chickens and feed them, so you can enjoy fresh eggs whilst you stay here. Also we have guinea pigs that enjoy a fuss, and we are also happy to take you down to see the horses for a pat under supervision. We also have a large vegetable garden so when possible we like to share our vegetable's with our guests.